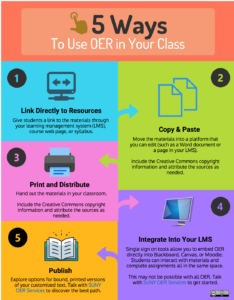 Beyond what’s already hosted inside the SUNY OER Services platform, many OER collections contain useful material for Technical Writing and Communication courses. If you have suggestions of public domain or Creative Commons content to add here, please let us know. The timeline for options #4 & #5 can vary, and will be discussed as part of your consultation with SUNY OER Services. Get started with consultation services here.